QuoteWerks integrates with QuickBooks Online Simple Start, Essentials, and Plus in the United States, Canada, United Kingdom, and Australia. Looking for the QuickBooks Desktop integration? The QuoteWerks QuickBooks Online integration requires a separate paid integration subscription and is only available in the Professional Edition of QuoteWerks and higher. QuoteWerks can search QuickBooks Online for contacts to be used on Quotes. You can also use one of the many CRM or PSA integrations for contact information on your quote or estimate. QuoteWerks can link to and search the QuickBooks Online item list, so you can add QuickBooks Online items to your quote. Export your QuoteWerks documents to QuickBooks Online estimates, sales orders, or invoices one at a time, or in batches. When selling the same Item outright versus accepting monthly payments for the Item, QuoteWerks can automatically associate them with different income and asset accounts in QuickBooks Online. When the document is exported, you can set a default tax item name to use with all exported documents, or you can be prompted to select the tax item name for each document exported. QuickBooks Online custom fields are supported. Export your Purchase Orders to QuickBooks Online. You can quickly see all of the unordered items in QuoteWerks and can easily create QuickBooks Online Purchase Orders that contain items from one or multiple Orders in QuoteWerks. Items that do not exist in QuickBooks Online will be created, and the QuickBooks Purchase Order number will be written back into the line items from the orders. Additionally if you are using the Online Ordering feature of the real-time module, after the items are ordered you will be asked if you want to create a Purchase Order in QuickBooks Online for the items you just ordered electronically through distribution. When selling the same Item outright versus accepting monthly payments for the Item, QuoteWerks can automatically associate them with different income and asset accounts in QuickBooks Online. If the customer in the QuoteWerks document does not exist in QuickBooks Online, it will be automatically created. If the customer already exists in QuickBooks, the customer information can be optionally updated automatically. If items/parts in the QuoteWerks document do not exist in QuickBooks Online, you will be prompted to select the type of item it is (Inventory, Non-inventory, or Service), and you will be prompted to select the income/expense account to be associated with this new item. When QuoteWerks creates Items in QuickBooks Online, it populates most of the fields you typically use like the Preferred Vendor field. If you use your own part numbers in QuickBooks Online instead of manufacturer part numbers, QuoteWerks can work with your system, even helping you auto-generate your own proprietary QuickBooks Online part numbers. If other details such as terms and ship via do not exist in QuickBooks Online, they are automatically created. Documents exported to QuickBooks Online are marked as exported so you will know which documents have been exported, and which have not. I already use QuickBooks Online how will QuoteWerks complement it? While there is cross-over in the functionality of QuoteWerks and QuickBooks, they are considered complementary products, not competing products. QuoteWerks software is the link between contact managers and accounting software. It was designed to allow each of the respective software product do what they do best. Accounting software supports receivables, payables, purchasing, inventory management, asset management and payroll. Contact management software allows you to manage your customers, leads, and marketing just to name a few. QuoteWerks on the other hand employs both. It enables you to utilize information stored about a customer in your CRM package to generate a sales quote that can be exported to your accounting software for purchasing, invoicing, and receivables. Quoting software is used by companies that do not want to flood their accounting software with part numbers and quotes that may never be used or become orders. Another reason for using quoting software is for larger offices that have many sales people, and do not want all of the sales people using the accounting software for two reasons. First accounting software licenses are generally more expensive than quoting software licenses, and secondly, there are security issues relating to lots of sales reps having access to your accounting software. Quoting software is also more flexible in terms of tweaking profit margin, more pricing models, links to other software such as contact managers etc. Quoting software has a specific niche of its own that fills in the quoting gaps left behind by CRM and accounting software. There are many reasons why not to use your accounting software for creating price quotes. The following is a list of reasons to use QuoteWerks instead of QuickBooks for your quoting needs. It is not to say anything negative about QuickBooks. In fact, in our opinion QuickBooks is a fantastic accounting package (we use it internally), but is simply not a good quoting solution as compared to QuoteWerks. • QuoteWerks links with Contact Management Software. With these links you can easily pull your prospect name and contact information into the quote and when the quote becomes an order QuoteWerks will create that new customer in QuickBooks eliminating any re-typing of data. Also, the links write data back to the contact manager such as a follow up call and sales opportunity forecasting. QuickBooks does not write back to the contact manager, nor does it offer the level of integration that QuoteWerks does. In QuickBooks before you can quote an item to a customer you have to create that item in QuickBooks. Creating the item in QuickBooks requires that you specify a part number, description, income account, cost, price, etc. 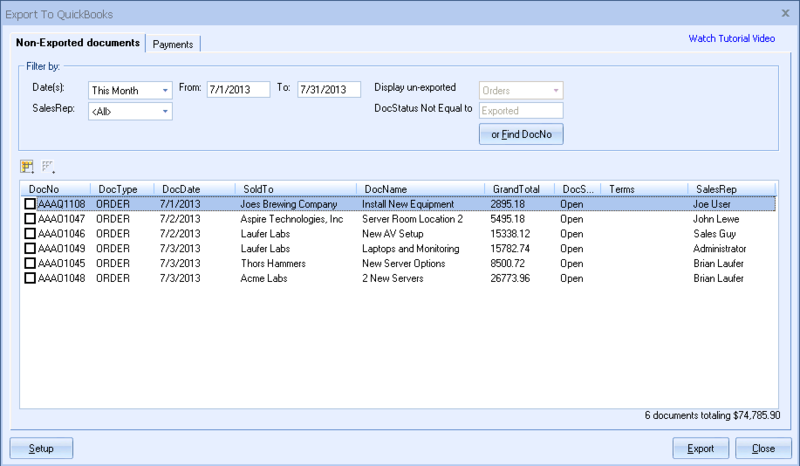 Then if the quote/estimate does not become and order, this item stays in QuickBooks cluttering your item list. In QuoteWerks, you do not have to create an item before you quote it. Additionally, when the quote becomes an order, QuoteWerks will create the item in QuickBooks for you using the description, part numbers, costs, and prices used in the order. With QuoteWerks a virtually unlimited number of users can be using QuoteWerks across the network at the same time. QuickBooks supports a maximum of only 10-users running QuickBooks at the same time and in many cases only enables one user to access an area of QuickBooks at the same time. QuoteWerks supports 9 different pricing methods including Markup, Discount, Gross Margin, Volume based, List, Formula, Fixed, Customer Price Levels, and Customer/Product price matrix. QuickBooks allows for only a few pricing methods. QuoteWerks has the ability to specify required items. For instance, when you add Part A, QuoteWerks will also add Part B, Part C, and Part D because they are a requirement of Part A. QuickBooks does not offer this functionality. You can also specify substitute and optional items. • QuoteWerks has links to the pricing databases of PC Industry distributors D&H, Ingram Micro, SYNNEX, and Tech Data. Additionally, QuoteWerks can get Real-Time Pricing & Availability from D&H, Ingram Micro, SYNNEX and Tech Data® extending the reach of how far a bridge QuoteWerks can create between the outside world and QuickBooks itself. QuoteWerks has the ability to compare item prices between vendors and show the best price.. The tool will also allow you to specify which vendor(s) to search on. QuickBooks does not offer this tool. QuoteWerks can easily hide the prices of certain items in a document. You can specify what an items print properties are through an item attribute menu. QuickBooks does not offer this functionality. QuoteWerks provides many document automation features. It enables you to very easily select and combine cover sheets, spec sheets, and literature documents that support the quote for simple delivery of the quote by print or by e-mail. QuickBooks does not support these features. QuoteWerks enables you to organize and view your products in multi-level folder trees. QuickBooks only displays the product list in a straight list format. QuoteWerks can easily calculate your profit margin per quote, order, and invoice, and is readily available. QuickBooks does not show profit margin very easily. Normally you would need to run a report to get this information. What does the QuickBooks Online link cost? The QuickBooks integration requires a Paid Subscription and the Professional and Corporate Editions. If I purchase a multiple-user license of QuoteWerks, do I need to buy multiple copies of the QuickBooks Online link? No. You only need to have the Professional or Corporate Edition of QuoteWerks along with the paid subscription no matter how many users you have at that site. Can I get a demo version of the QuickBooks Online link? Yes. Please contact QuoteWerks sales at sales@quotewerks.com or 407-248-1481 to request a trial of the QuickBooks Online Subscription. Love the Salesforce.com and QuickBooks integration. Also like the product database way of doing things. Like being able to use different layouts and sync.